For the first time ever, an Israel-initiated draft resolution has passed the U.N. General Assembly. After a lengthy diplomatic process, which lasted more than six months, UN member states supported the resolution in a vote of 118 countries in favor, with 29 abstentions and no objections. 80 U.N. member states signed on as co-sponsors to Israel's resolution. The resolution, passed by the economic and financial committee, requests that developed nations share their agricultural technology expertise with less developed nations, in particular the eradication of extreme poverty and hunger. The resolution calls on the UN Secretary General to submit a report to the General Assembly on its implementation within two years. The resolution is the culmination of an unprecedented process in which Israel for the first time initiated a socio-economic resolution at the UN General Assembly, on the first subject which the UN has set among its Millennium Development Goals (MDGs) - the eradication of poverty and elimination of hunger, with the goal of halving the world level of poverty and hunger by 2015. The resolution adopted today by the UN gives expression to Israeli know-how in the areas of agriculture, fighting desertification, rural development, irrigation, medical development, computers and the empowerment of women, as reflected for many years in Israel's contribution to developing nations, particularly in Africa. "B'nai B’rith applauds Israel on this diplomatic milestone," said Executive Vice President Daniel S. Mariaschin. "Israel has a particular expertise in the area of agriculture and should be recognized for pursuing actions that will help fight poverty and hunger." As the only Jewish organization with an office devoted exclusively to United Nations affairs, B’nai B’rith is pleased that Israel has been acknowledged by fellow Member States. Vice Prime Minister and Minister of Foreign Affairs Tzipi Livni welcomed this first adoption by the UN of an Israeli-sponsored resolution on agricultural technology. The adoption of this resolution represents a great diplomatic achievement for Israel. The resolution places Israel on the map as a leading actor in global affairs, not limited to the Israeli-Palestinian conflict. FM Livni praised the intensive efforts of the ministry’s International Affairs Division and its delegation to the United Nations which led to this successful outcome. The diplomatic initiative which won the support of the international community was drafted at the Foreign Ministry in Jerusalem and presented by Israel's delegation to the UN General Assembly. Through intensive efforts over the last six months in New York, Jerusalem and world capitals, a coalition of UN agencies and states came together to shape the resolution adopted this evening. Negotiations with the different countries as well as the relevant UN agencies in the fields of food, agriculture and socio-economic development were conducted in a professional and businesslike manner throughout. Israel's Foreign Ministry thanked all the UN members who were partners in actively supporting and co-sponsoring this resolution, as well as those who voted for it. 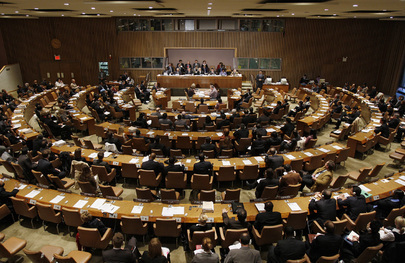 The broad support for the resolution testifies to its importance to many countries, especially the developing countries. This is an important achievement for Israeli diplomacy, reflecting Israel's desire to fulfill its role in the UN institutions and the international community in the professional arena, and to demonstrate their high level and capabilities in the area of science and research. Now, after the adoption of resolution, will begin the phase of implementation, in cooperation with the relevant UN bodies and states, in which Israel’s contribution will be brought into practice. Albania, Andorra, Argentina, Armenia, Australia, Austria, Azerbaijan, Belgium, Bosnia and Herzegovina, Brazil, Bulgaria, Canada, Chile, Costa Rica, Côte d’Ivoire, Croatia, Cyprus, Czech Republic, Denmark, Dominican Republic, El Salvador, Estonia, Ethiopia, Fiji, Finland, France, Georgia, Germany, Greece, Grenada, Guatemala, Honduras, Hungary, Iceland, Ireland, Israel, Italy, Japan, Kenya, Latvia, Liberia, Lithuania, Luxembourg, Madagascar, Malta, Marshall Islands, Mexico, Micronesia (Federated States of), Moldova, Montenegro, Nauru, Nepal, Netherlands, Norway, Palau, Panama, Paraguay, Poland, Portugal, Romania, Rwanda, San Marino, Slovakia, Slovenia, Solomon Islands, Spain, Sweden, Switzerland, Thailand, the former Yugoslav Republic of Macedonia, Turkey, Uganda, United Kingdom of Great Britain and Northern Ireland, United States of America and Uruguay. Requests the Secretary-General to submit to the General Assembly at its sixty-fourth session a report on the implementation of the present resolution. Afghanistan, Albania, Andorra, Angola, Antigua and Barbuda, Argentina, Armenia, Australia, Austria, Bahamas, Barbados, Belgium, Belize, Benin, Bhutan, Bolivia, Bosnia and Herzegovina, Botswana, Brazil, Bulgaria, Burkina Faso, Cambodia, Canada, Central African Republic, Chile, China, Colombia, Congo, Costa Rica, Côte d'Ivoire, Croatia, Cyprus, Czech Republic, Denmark, Ecuador, El Salvador, Eritrea, Estonia, Ethiopia, Finland, France, Georgia, Germany, Ghana, Greece, Guatemala, Guinea, Guyana, Haiti, Honduras, Hungary, Iceland, India, Ireland, Israel, Italy, Jamaica, Japan, Kazakhstan, Kenya, Lao People's Democratic Republic, Latvia, Liberia, Liechtenstein, Lithuania, Luxembourg, Madagascar, Malawi, Malta, Marshall Islands, Mauritius, Mexico, Micronesia (Federated States of), Moldova, Monaco, Mongolia, Montenegro, Mozambique, Myanmar, Nauru, Nepal, Netherlands, New Zealand, Norway, Pakistan, Palau, Panama, Paraguay, Peru, Philippines, Poland, Portugal, Republic of Korea, Romania, Russian Federation, Saint Lucia, San Marino, Senegal, Serbia, Singapore, Slovakia, Slovenia, Spain, Sri Lanka, Suriname, Sweden, Switzerland, Thailand, The former Yugoslav Republic of Macedonia, Tonga, Turkey, Ukraine, United Kingdom, United States, Uruguay, Uzbekistan, Venezuela, Viet Nam. Algeria, Bahrain, Brunei Darussalam, Djibouti, Egypt, Indonesia, Iraq, Jordan, Kuwait, Kyrgyzstan, Lebanon, Lesotho, Libya, Malaysia, Mauritania, Morocco, Niger, Oman, Qatar, Saudi Arabia, South Africa, Sudan, Swaziland, Syria, Tunisia, United Arab Emirates, Yemen, Zambia, Zimbabwe. Azerbaijan, Bangladesh, Belarus, Burundi, Cameroon, Cape Verde, Chad, Comoros, Cuba, Democratic People's Republic of Korea, Democratic Republic of the Congo, Dominica, Dominican Republic, Equatorial Guinea, Fiji, Gabon, Gambia, Grenada, Guinea-Bissau, Iran, Kiribati, Maldives, Mali, Namibia, Nicaragua, Nigeria, Papua New Guinea, Rwanda, Saint Kitts and Nevis, Saint Vincent and the Grenadines, Samoa, Sao Tome and Principe, Seychelles, Sierra Leone, Solomon Islands, Somalia, Tajikistan, Timor-Leste, Togo, Trinidad and Tobago, Turkmenistan, Tuvalu, Uganda, United Republic of Tanzania, Vanuatu.